16/07/2003 NST-CITY - BUYERS of the Kuchai Square shoplots in Taman Kuchai Jaya in Jalan Kelang Lama, Kuala Lumpur are frustrated over the now abandoned project. The purchasers are claiming that for the past three years, they have had to service their bank loans although the units were only 50 per cent completed then. 18/06/2003 BH - SAYA adalah pembeli Apartmen Blok 6 di Lagoon Perdana, Bandar Sunway, Selangor. Pemaju memaklumkan bahawa apartmen ini berjaya disiapkan pada 21 Februari lalu. New contractor appointed to revive stalled project at PJS 9 14/06/2008 The Star . 13/12/2000 BH By Saufi Hamzah - ALLAN Chia, pemenang hadiah permainan sempurna dalam Kejohanan Terbuka Antarabangsa Malaysia Mac tahun lalu, begitu kecewa kerana rumah dua tingkat berharga kira-kira RM355,000 yang dimenangi masih belum siap sepenuhnya. Sehingga kini, bekas pemain kebangsaan itu hanya menerima surat perjanjian jual beli pada April tahun ini daripada pemaju yang bertanggungjawab membina rumah berkenaan di kawasan Lembah Beringin. 21/11/2001 MM By Sushma Veera - MORE than 500 people who bought houses in Lembah Beringin thought it would be a Hollywood-style neighbourhood as promised by the developer, Lembah Beringin Sdn Bhd, only to be disappointed when the project stopped in 1997 due to the economic slowdown. But after waiting for more than five years for their dream homes, the buyers are relieved to have found a glimmer of hope to settle their problems. 28/06/2002 BH - KUALA LUMPUR, Khamis - Land and General Berhad (L&G) akan menyambung semula projek perumahannya yang terbengkalai di Lembah Beringin pada Ogos ini dan menjangka dapat menyiapkannya dalam tempoh 12 bulan. Pengarah Eksekutifnya, Mohd Razeek Hussain, berkata anak syarikatnya, Lembah Beringin Sdn Bhd, pemaju projek itu akan menyambung semula kerja membina 1,000 unit rumah projek itu. 27/07/2002 BT - A HOUSE buyer has served a winding-up petition on Lembah Beringin Sdn Bhd but the Land & General Bhd subsidiary is scheduled for a hearing on its application to restrain him from filing the petition. L&G said it had applied for the injunction on June 11, and the hearing will be held on August 13. It said the buyer won his case last year, and got an order for Lembah Beringin to refund roughly RM280,000 that he had paid. L&G said it had invested RM16.1 million in Lembah Beringin and the expected loss from the winding-up proceedings is insignificant. 21/03/2002 BT - MALTON Bhd's subsidiary, Domain Resources Sdn Bhd, has been given the task to revive the RM350 million Malaysia China Light Industrial City (MCLIC) project in Malacca. Domain Resources has been appointed as the project manager for the 162.8-ha MCLIC, said Malton executive director Philip Ho during a media tour at the project site in Malacca yesterday. 22/03/2002 BH By Daud Awang - DOMAIN Resources Sdn Bhd (Domain Resources) memperoleh hak memulihkan projek perumahan dan bangunan komersial terbengkalai bernilai RM350 juta di Bandar Industri Ringan Malaysia China (MCLIC) di Tanjung Minyak, Melaka. Berikutan itu, Domain Resources, iaitu sebuah syarikat milik penuh Malton Bhd kini bertanggungjawab sepenuhnya terhadap pembangunan projek di tapak seluas 162.8 hektar yang sudah terbengkalai sejak 1999 itu. 27/02/2003 BH - SAYA mewakili pembeli kondominium Mas Kiara tidak puas hati dengan projek yang masih terbengkalai selama lapan tahun. 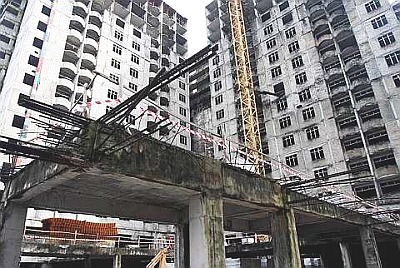 06/05/2006 NST - BLUESTONE Group Malaysia (Bluestone) will revive an abandoned, half-completed building in Pudu, Kuala Lumpur, that was once undertaken by Li-Foong Group, and turn it into RM200 million commercial project. It will be undertaken on a joint venture basis with Allco Funds Management (Singapore) Ltd (Allco FMSL), a 100 per cent owned subsidiary of Australia's Allco Finance Group Ltd, which specialises in asset-based structured finance. 27/02/2008 New Straits Times By Lee Keng Fatt - GEORGE TOWN: Two abandoned housing projects in the state, one of them in Kepala Batas, will be revived. This follows the signing of a memorandum of understanding between UDA Holdings Bhd's subsidiary, UDA Land (North) Sdn Bhd, and Koperasi Serbaguna Jelutong Pulau Pinang Berhad (KSJPP) yesterday. 13/02/2008 The Star - I AM one of the victims of an abandoned housing project. Before it happened to me, I had come across many stories of housing projects being abandoned for years but I never imagined that I would be one of the victims. 27/02/2008 Utusan Malaysia - PULAU PINANG 26 Feb. – Lebih 60 pembeli dua projek perumahan yang terbengkalai di Seberang Perai sejak 2005, boleh menarik nafas lega apabila projek itu akan disambung semula pembinaan dalam suku kedua tahun ini. 31/01/2009 Utusan Online ... BUKIT MERTAJAM 30 Jan. - Projek rumah banglo di dua kawasan perumahan berasingan, Taman Mengkuang Heights dan Taman Orkid Indah di Jalan Maqbul di sini yang terbengkalai sejak Julai tahun lepas masih belum diteruskan. 20/01/2003 BH-TGH - KEPALA BATAS: Kerajaan negeri diminta mempercepatkan projek perumahan di Merbau Kudong yang tertangguh lebih tiga tahun lalu, kerana ramai penduduk berminat untuk membelinya. Projek yang dicadangkan itu membabitkan lebih 300 unit rumah pelbagai jenis dan sebahagian besarnya kos rendah akan ditawarkan kepada penduduk tempatan, terutama yang berpendapatan rendah. 15/08/2002 NST-CITYBy Shuib Taib - BUYERS of the two stalled housing projects in Subang Jaya - Rhythm Avenue Apartments and Newgate Apartments - are advised to attend a buyers' committee meeting this Sunday to determine their next course of action. "At the meeting, buyers will be professionally advised on their rights as purchasers in the sales and purchase agreement and under the law of this country. 20/08/2002 NST-CITY - SOME buyers of the stalled Rhythm and Newgate Avenue service apartment projects in USJ, Subang Jaya are initiating legal action against the developers to reclaim their monies with interest. The buyers met officials of the Consumers Association of Subang and Shah Alam, Selangor (Cassa) last Saturday to request further action by the association to protect their rights and interests in the matter. 22/08/2002 NST-CITY - BUYERS of the stalled Rhythm Avenue and Newgate Avenue service apartment projects in USJ Subang, have formed a "Buyers Committee" to solve their problems. The 20-member committee had their first meeting yesterday with the senior managers of Sanjung Utama Sdn Bhd and Solarglow Sdn Bhd, the developers of the projects, which have stalled for 11 months. 30/04/2004 NST-CITY - THE Rhythm Avenue and Newgate Avenue Purchasers Committee are appealing to bridging financiers AM Finance Berhad (for Rhythm Avenue service apartments in USJ19) and RHB Bank Berhad (for Newgate Avenue service apartments in USJ20) to seek a fast solution to complete both projects. Committee chairman Pritpal Singh Sidhu said it had been three years since the projects were abandoned and the purchasers were facing a daunting task of paying monthly interest to the banks. SAYA adalah pembeli rumah Nusa Mewah Villa Kondominium di Bukit Pandan, Pandan Indah, Cheras. Mengikut perjanjian, rumah itu siap pada bulan Julai 2005. Malangnya projek itu tertangguh. Pihak pemaju telah berjanji projek itu diteruskan.